You probably have your own reason for owning a hat to wear while you are golfing. However, if you needed a reason, there are a few different ones that you will want to consider. Golfing generally puts a lot of strain on your eyes since you have to survey long distances in order to set up your shot. You may have to look into the sky in order to watch the ball as it travels in order to see where it lands. Furthermore, there is little doubt that you will be spending a significant amount of time in the sun and you will need something to protect your head from the harmful UV radiation. There are plenty of reasons to wear a hat while you are golfing so you will want to keep an eye out for some of the best golf hats. You will find that there is almost an endless selection so there is a high probability that you will find something that you will absolutely love. Golfer hats come in different shapes and styles and a wide variety of price points. They are the perfect thing to have on the course so you should always have at least one hat stuffed into your golf bag. 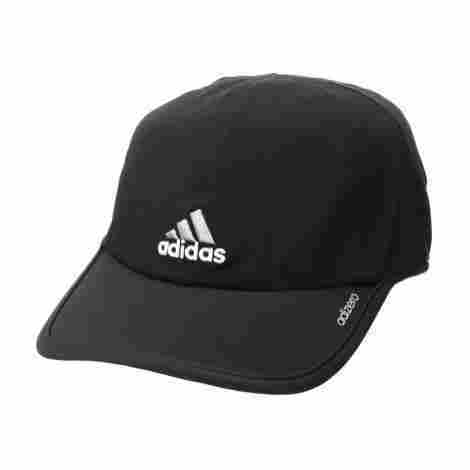 Adidas is a brand that is well associated with sports apparel so it's no surprise that they make hats that are well suited for outdoor activity. This hat will feel soft and lightweight. It also breathes well which will help your head stay nice and cool even on the hottest summer days. You will love how well it shades your head and your eyes. The Climacool (TM) is a technology that will help to keep your head nice and dry even when it's hot and humid outside. This will help you to stay comfortable. The inside of the hat has a sweatband that will absorb and wick away moisture from your head. This will keep sweat from dripping into your eyes and your face and help you stay comfortable. You will be able to find this item at a price that is around the average. The average price is a great benefit since you get a high-end hat without paying a premium for it. It's made with a blend of polyester and spandex material. You can match it to plenty of other Adidas brand clothing. There are mesh panels in the hat which help it vent. It offers you UPF protection to help reduce sunburns and skin disease. You won't feel sweat getting into your face because of the sweatband. Users have had issues with it not fitting properly on their head. The tightening belt doesn't stay put and will keep getting loose. Anyone who is looking for 360-degree sun protection will love this hat. It's specifically designed to keep your cool and protected in the hot summer days. This will reduce sun exposure on your head and it will also help your stay cool which makes it ideal for the golf course. Any golfer will love to wear one of these hats. 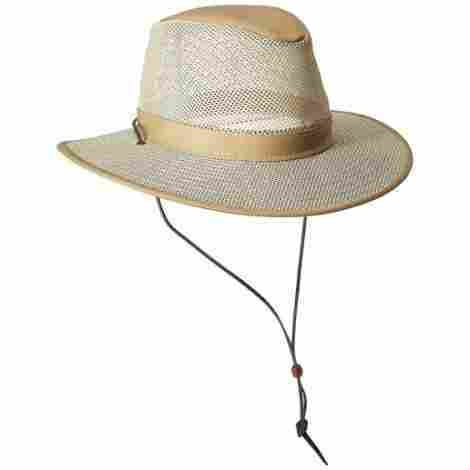 The brim is circular and surrounds your entire head which offers you total sun protection. You won't have to worry about it collapsing on you either because it has foam to keep it stiff. UV radiation is dangerous and can lead to your developing skin diseases. 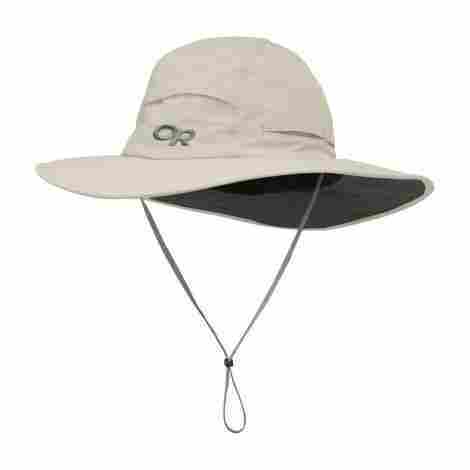 This hat will reduce the amount of UV exposure to your head thanks to its UPF 50+ rating. You will find this item sold at a price that is slightly higher than the average price. It's made of high-end materials that justify the slight upcharge thanks to the added value. It's made completely of nylon so it's lightweight and breathes well. The crown is lined with mesh to help improve breathability. It protects your head from harmful UV radiation on all sides. The drawcord can be adjusted with only one hand. There is floating foam in the brim to help it stay stiff. The chin cord doesn't always stay tight which causes the hat to get loose. The brim doesn't stay flat like it should so it can look odd. If you find that your hat feels too hot and heavy then you may want to try this one from Henschel. It's specifically designed to breath well so that your head stays nice and cool while you still get plenty of shade. It's great for anyone who regularly golfs in hot climates and needs a hat that is specifically designed for such weather. Rather than being solid, this hat is made of a cotton mesh material. The mesh allows for the maximum amount of airflow so that your head can sweat and breathe normally. The fact that it's crushable makes this the perfect item to throw into your golf bag. This will help to make sure that you always have a hat while you are on the course. You will be able to get one of these hats at a price that is slightly lower than the average price. The lower price is because of the mesh material that costs less to make. 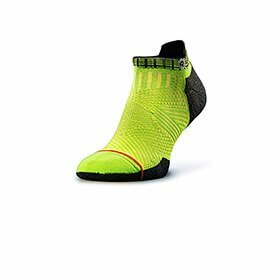 It's made of a cotton mesh material that maximizes breathability. You can crush it and pack it into a bag. It's made in the United States of America. There is an adjustable cord that keeps it from blowing off. You can purchase it in one of seven different colors options. The mesh material will not protect you from UV radiation. Users have had issues with the size being inaccurate. There is no doubt that the golf course is going to be drenched in the sun which is why you need to make sure that your head is fully protected in such situations. This hat does the job perfectly by blocking almost all UV radiation. It's a great looking hat that has been fully designed with the needs of golfers in mind. It has a UPF 50+ rating and will block 98% of UVA and UVB radiation. This makes it the ideal thing to wear when you are on the course since you get proper sun protection. The crown has an elastic drawcord that you use to adjust the fit of the hat. This will help it to stay nice and tight on your head so it doesn't fall off or tilt. You will see this item sold at a price that is slightly higher than the average price. The higher price is due to the superior construction that adds value to it. It has been designed to block almost all UV radiation. It will breathe well since it's made of polyester material. You can adjust the fit on the crown by using the cord. There is a sweatband that keeps sweat out of your face. The brim is four inches in the front and three inches everywhere else. Users have reported that it is hard to find the proper fit. Other users have mentioned that it can feel heavy. Nike is another brand that is highly associated with high-quality sports apparel. You will be able to trust that this hat will live up to your expectations. It offers plenty of high-end features such as fabric that dries quickly and will block UV radiation. It also holds its shape well so it continues to look great and new. Nike uses their Dri-Fit fabric to make this hat. It will wick away sweat and moisture from your head so that you continue to feel nice and comfortable all day long. The crown has a drawcord that you can use to adjust the hat's fit. This will help to make sure that it doesn't sag, tilt, or fall off of your head. This is a premium product so you will need to plan on spending an amount that is well above the average price. The value comes from using premium materials such as Dri-Fit fabric. It's made of polyester and spandex that is woven together. The material will provide you with protection against UV radiation. You can adjust the crown in order to get the perfect fit. It's available in four different colors and has size options. You won't have any trouble matching it with other Nike clothing. Users have had problems with getting the proper size for them. The bill has been known to develop creases that won't go away. 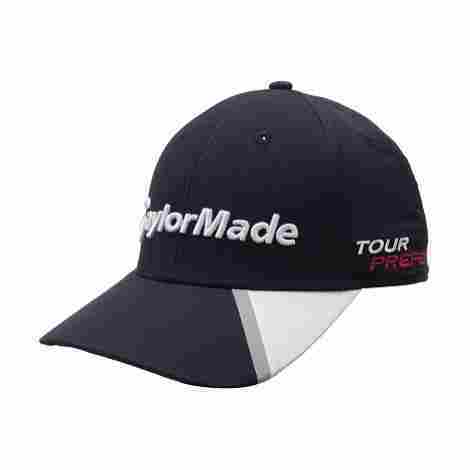 TaylorMade is a well-known golf brand and you will love how this hat looks and feels while you are on the course. It will be easy to keep track of your ball thanks to features that will help to reduce glare while you are looking over long distances. Furthermore, it offers you comfort and protection on the hot summer days. The underside of the bill has a dark color. This will help to reduce glare that you would otherwise see while you are looking at long distances because the dark color absorbs light. 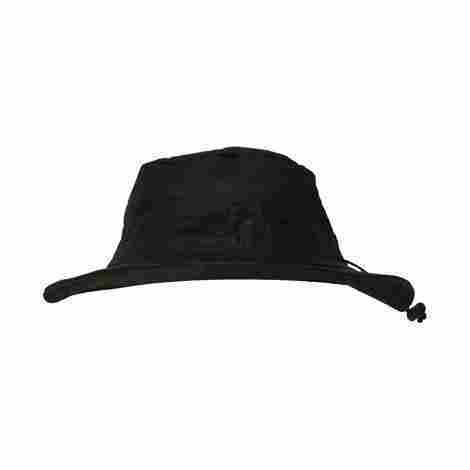 It's made of polyester material so the hat will be lightweight and also wick away moisture. This will keep your head from feeling sweaty in the hot summer heat. You will be able to purchase this hat at a price that is lower than the average price. This turns it into an excellent value since it's a high-quality hat that lets you save. It uses 100 percent polyester material so that it's comfortable. The inside of the bill has a dark color that will reduce glare. There is an adjustable band on the back to get the right fit. It offers you a UPF 50 protection against UV radiation. There are vents throughout the hat to help it breathe well. Many users have reported that it's too small for them. You only get one color option and size option for this hat. 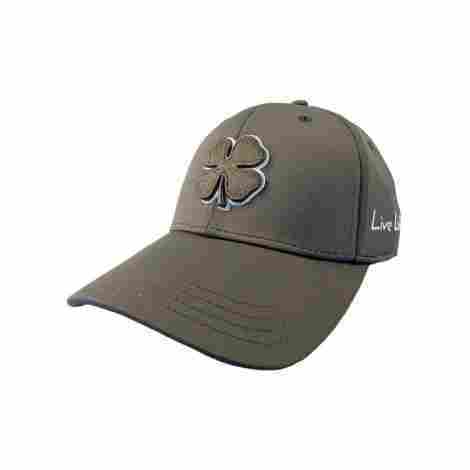 Black Clover will provide you with more than enough sun protection while you are on the course. This is a fitted hat that has a large brim so that you get more than enough shade and glare protection. It's also made with a stretch fabric that will provide you with the perfect fit so it's less like to tilt or fall off. It uses a stretch fit fabric so that it has a great fit all of the time. This will help to keep it from tilting or blowing around on your head. It's made with a mesh material that allows the hat to feel comfortable and breathe well. This will help to keep your head nice and cool while you are on the course. You will be able to purchase this hat at a price that is slightly lower than the average price. The lower price makes it a great option for when you are looking for something that is inexpensive. The hat is sold in fourteen different options for personalization. It has a memory fit that helps it fit your head properly. It's made with a performance mesh that will help it stay cool. The fabric has a stretch fit that helps it stay tight. There is a large brim on the front that will protect your eyes. Users have had problems with finding a size that fits. Users have reported that it loses its elasticity after a while. Many people purchase Under Armour products because the brand has been known to develop high-quality sports apparel that you can trust. 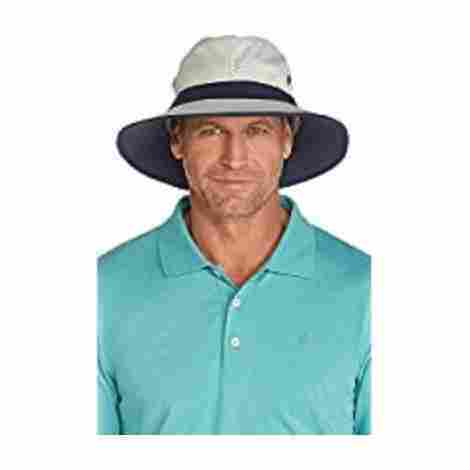 This hat is perfect for the golf course because it protects your head from sweat, the sun, and it feels cool and comfortable. 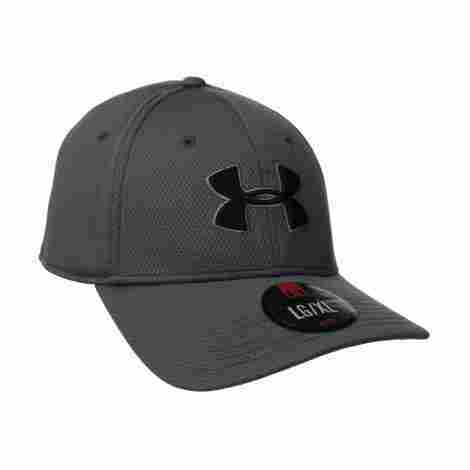 You will love the look and feel of it and it can be matched to your other Under Armour gear. The structured design will help to make sure that it maintains its shape for years at a time. This will help it to continue to look nice and new even after washing it. The bottom of the hat's crown has a sweatband that is built into the hat. This will keep sweat from dripping down into your face and your eyes. You will be able to purchase this hat at a price that is lower than the average price. The lower price makes it great for when you need a great hat without having to spend much. The fabric is made completely of polyester so it's comfortable. There are vents located throughout the crown to help it breathe. It has a structured design that helps it hold its shape. There is a moisture-wicking sweatband built into it. It's sold in a multitude of color and size options. Users have had issues with it being smaller than they expected. The hat will start to lose its elasticity after a while. Even if you don't end up in the rain while you are on the course, you may still be unlikely enough to get sprayed by a sprinkler. This hat is completely waterproof but it also breathes well so you will feel cool and dry while you are wearing it on and off of the course. It's the perfect thing to stuff into your golf bag. It's completely waterproof so your head will stay dry if you are unlikely enough to end up in the rain or under a sprinkler. It still breathes so you won't feel hot and sweaty. There's no need to worry about it blowing off of your head in the wind. It has a shock cord that is adjustable so that you can keep it on your head. You will be able to purchase this hat at a price that is well below the average price. The lower price makes it perfect for when you need a high-quality hat at a low price. The hat is made of a waterproof material that still breathes. You can adjust the tension cord and the chin strap. It has a one-inch brim that surrounds the hat. It can be crushed and stored in a golf bag. It's sold in four different color options that you can pick from. Users have seen the hat leak water at the seams. It does breath but not very well which can make it feel hot. 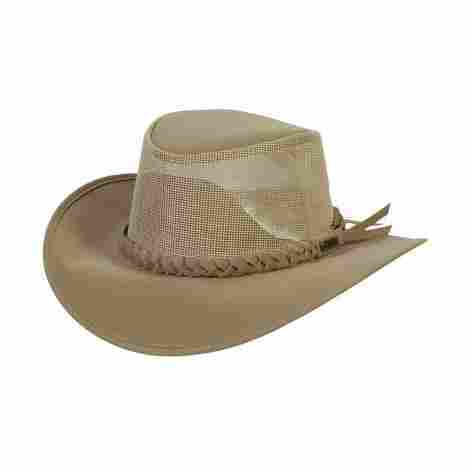 Here is a 360-degree hat that will offer you an outback look. It has a mesh crown that helps it to stay cool but the brim is made of solid material to protect your eyes and face from the sun. You will love how easy it is to pack it in your golf bag so that you always have something to wear. The crown of the hat is made of a mesh material. This will help it to breathe well so that you don't end up feeling hot and sweaty while you are in the heat. It's been designed to allow you to crush it. A crushable hat is easy to store in your golf bag so that you always have a hat with you on the course. You will need to pay a price that is slightly higher than the average price. The higher price is due to it being made by hand which increases the cost. The crown is made of a mesh material that lets it breathe. You can crush this hat and stuff it in your golf bag. It can be soaked in water so it won't get ruined in the rain. There is a decorative woven band that surrounds the crown. The large brim is solid and protects you from the sun. The crown will not provide you with any UV protection. The material does not absorb sweat so you can get sweaty in the headband area. Golfers end up spending a lot of time in the sun which is why it’s important that you have proper sun protection so that you don’t get sunburns or skin disease. Sun protection starts with a high-quality hat that will keep the sun off of your head, face, and the back of the neck. You should always be on the lookout for a hat that has a large brim that will protect your eyes when you are looking at long distances. This will help you see the golf ball while it’s in flight and help you see where it lands. Many hats are sold in different shapes, sizes, styles, colors, and price points. That means you will have no trouble with finding a hat that is best suited to your needs. It’s always recommended to have a hat on the course and it may not be a bad idea to get one that you can crush and store in your golf bag so that you always have a spare. This will help to ensure that you are always protected while you are on the course on a bright sunny day which will help you enjoy your game more and in comfort. It’s important to remember that is almost an endless number of styles of hats that can be worn on the course. However, some of the hat styles are more common than other ones. The most common style of hats worn on the course are ball caps, bucket hats, Panama hats, and visors. You are going to want to pick on that you are comfortable wearing so that you get the most satisfaction from your hat. The ball cap is typically referred to as a baseball cap. These hats have a large brim on the front and are normally adjustable on the back of the hat. While they are good at protecting your face, these hats do not have any protection on the back so they may not be a good option for the course. 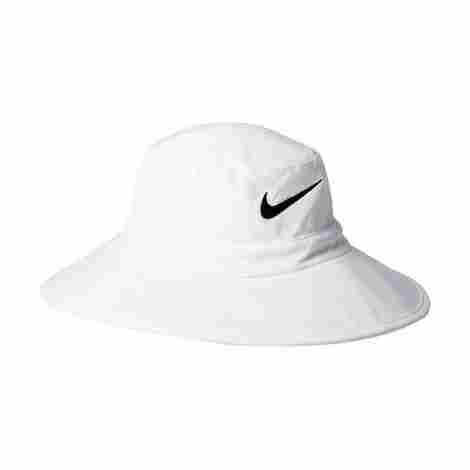 A bucket hat is better suited for the course because it offers protection from the sun on all sides of the hat. However, you are going to need to check the dress code at your club because sometimes golf courses consider these hats to be too casual to wear on the course. If you aren’t allowed to wear a bucket hat, then you will want to consider a Panama hat. Panama hats have protection on all sides of the hat but the look is more formal which makes it more permissible to a wide variety of golf courses. The final kind of hat is a visor, which is a hat that doesn’t have a crown. This will only protect your eyes and face but it doesn’t protect your head or the back of the neck. Visors are worn because they are cool and breath well but they don’t offer a lot of sun protection. Since golf is typically played in hot weather, you are going to need to make sure that your hat breathes well. If you have a hat that traps a lot of moisture, then you are going to end up feeling hot and sweaty while you are wearing it which means that you are more likely to take it off when you should have it on. It’s always a good idea to look for a hat that vents well and is moisture wicking so that you don’t experience problems while you are wearing it. There are a few different ways for a hat to vent. One way is to have a metal vent hole spread throughout the crown of the hat. This design only provides you with a minimal amount of ventilation but still gives you the maximum amount of sun protection. The next step is to have some sections made of mesh while other sections are made of solid material. The mesh panels will give the hat more ventilation but at the expense of protection against the sun since mesh allows light to pass through it. The final design is a hat that is made completely out of mesh. This design gives you the highest amount of ventilation but does so by sacrificing sun protection. When you are looking for a hat, you are going to need to decide how much ventilation you need as opposed to the amount of sun protection that you are willing to give up. There isn’t any right or wrong answer because both are important. For example, you may choose to wear sunblock on your head and go with a hat that has more ventilation. On the other hand, you may decide protection from the sun is more important. One of the main reasons for wearing a hot on the golf course is to get protection from the sun. While it’s easier on your eyes to have protection from bright light, the most important thing is protection against harmful UV radiation. UV radiation is what causes you to get sunburns and too much exposure to it will lead to serious diseases such as skin cancer. When you are looking for a hat to wear on the golf course, you are going to want to consider how much UV protection is provided by the hat. If the hat does not provide you with UV protection, then you will need to wear sunblock underneath it. Most hats will explicitly say that they provide you with UV protection. If the hat does not say that it will protect you from UV radiation, then you need to assume that it doesn’t have UV protection. A hat that does protect you from UV light will have a UPF rating. Just like sunblock, the higher the number, the better job the hat will do with protecting you from harmful UV radiation. You should try and find a hat that has the highest possible UPF rating. It’s also important that you wear sunblock on areas that are not shaded by the hat. For example, if your hat only has a visor on the front, then you need to wear sunblock on the back of your neck. Even if the hat is a 360-degree hat, it’s still a good idea to wear sunblock as this will give you additional sun protection. You can’t be too careful when it comes to sun safety. It’s important that you purchase a hat that fits you properly for a number of different reasons. A hat that doesn’t fit right can become problematic for you when you are on the course. Nobody wants to have a hat that fits their head too tightly or too loosely. The best hats for the golf course are ones that fit you snugly and are not too loose or too tight. You may not even be able to wear a hat that is too small for you in the first place. Even if you can squeeze into the hat, there are going to be problems. For example, it may put too much pressure on your head and cause you to get headaches. The hat may also pop off of your head or it may start to lose its shape. The opposite is also true as well. When your hat is too loose, it’s more likely to fall off of your head. Even it doesn’t fall off of your head, it may start to sag or fall down into your face. You can easily imagine how this can interfere with your golf swing and concentration. Furthermore, hats that are too loose can blow off of your head easily in the wind which can cause you to lose the hat completely. When you are picking out a hat for golfing, you need to make sure that it has the proper fit. It’s best that you read the size chart in order to figure out which size is best for you and also make sure that it has an adjustable band that will help make sure that you get the proper fit. Quality is an important part of owning a golfing hat. There are a few quality areas that you should check out when you are considering purchasing a golf hat. Those areas are the stitching, crown, and the brim. The hat should be well made in all of these areas or it is likely that it will start to come apart after you have worn it for a while. The stitching is critical because it holds the hat together. This means that all of the seams need to be sewn together properly and they brim needs to be attached properly. Low-quality stitching will cause the hat to fall apart and you won’t be able to continue to wear it. When you are looking at the seams, you should make sure that everything is stitched tightly. There shouldn’t be any loose threads and all of the seams should be straight as well. You should avoid any seams that are lopsided and favor one side of the seam of the other side. The brim is the next area that you should inspect. It needs to be firmly attached to the crown of the hat. You should also make sure that the brim is stiff enough to maintain its shape so that it offers the proper amount of sun protection. It’s also best to check if the underside of the brim has a dark color as this will protect you from glares when you are looking over long distances. The crown is the final area that you need to look at. It needs to be able to maintain its shape even after you have washed the hat. It shouldn’t be too deep or too shallow either. Finally, the crown should have sweatband so that you don’t have sweat dripping on your face or into your eyes. Q: How can I wash my golf hat? A: There are a lot of golf hats that can be machine washed but some of them are hand wash only. For this reason, you need to make sure to read the care tag on the hat. If you aren’t sure, then it’s best to wash it by hand in a bowl of mild soap and water. Then you should rinse it clean when you are done and hang it up to dry before you wear it again. Q: Why do professional golfers tend to wear hats? A: There are plenty of practical reasons to wear a hat on the golf course, but when it comes to professional golfers, it usually is because of sponsorships. Companies tend to pay a lot of money to get their name out and paying a professional golfer to wear their hat is one way to do this. Many people tend to watch golf on TV and if they see a professional wearing a certain kind of hat, then viewers may want to own the hat as well. Q: How can I tell if the hat is breathable? A: One way to tell is to see what sort of material is used to make the hat. Some materials such as nylon, spandex, and polyester tend to be highly breathable. You can always press the hat against your mouth and blow against it as well. If you feel the air on the other side of the hat as you are blowing, then you know that the hat is breathable. The final way to tell is to look at the construction. A solid hat is less breathable than one that is made of mesh. Q: How large of a brim should I have? A: A larger brim will give you more shade than a smaller brim. However, a hat that has a large brim will weigh more and may not stay where it should which can interfere with your game. Generally speaking, most golf hats have a 3 or 4-inch brim which tends to be sufficient for most people’s needs. You are free to get larger or smaller brims depending on your comfort preferences and your needs as a golfer. Q: Are visors a good choice? A: Visors can come in handy when it’s really hot outside. Women also tend to like visors since they don’t mess up their hair as much as a regular hat. However, visors have a major drawback in that they don’t protect the top of your head from the sun. For this reason, you may need to wear sunblock on your head in order to get the proper sun protection while you are wearing a visor.